HaShem. It seems clear that he and he alone is the actor in this narrative block. So what happened to Moshe's wife and sons? How do they fit into the picture? We know that verses 24-26 portray Zipporah and at least one son with him, so why is the last verb in our text not plural, "and they returned"? Ramban suggests that Zipporah was either heavily pregnant at this time, giving birth during the journey, or had only just given birth before the journey started. Ugaritic: A semitic language, spoken in the city of Ugarit in Syria in the 14th - 12th centuries BCE, and written in cuneiform; lost when the city was destroyed in 1180/70 BCE. 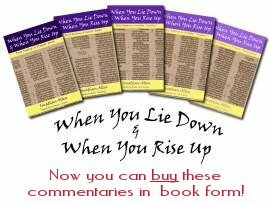 Used by the Caananite culture, it has been important for Hebrew scholars in clarifying the meaning and use of common words, idioms and expressions. Rashi, noticing that has a definite article, so translated "the donkey" rather that "a donkey", speculates: "on that particular donkey - the use of the definite article shows that it was a particular donkey rather than just any donkey. It is the donkey that Avraham saddled for the binding of Yitz'khak, and it is the one that Messiah, the King, is destined to be revealed upon, as it says, 'a humble man, riding on a donkey' (Zechariah 9:9). Matthew's gospel records the head of another family starting a migration - "And [Yosef] rose and took the child and his mother by night and departed to Egypt" (Matthew 2:14, ESV) - although there is no donkey mentioned in the text, there certainly is in tradition; Yosef would almost certainly have brought the pregnant Miryam to Bethlehem for the census on a donkey and would now be using the animal again for their journey on to Egypt. Notice the similarities here in the stories: a young baby boy, a journey taken after instructions in a dream or a conversation with HaShem, the destination - Egypt - and the temporary though possibly lengthy nature of the stay there. Both were to return only when directed by the L-rd. Unlike the Judeans who took Jeremiah down to Egypt after the destruction of Solomon's temple - "And they came into the land of Egypt, for they did not obey the voice of the L-RD" (Jeremiah 43:7, JPS) - both these journeys were blessed by HaShem. Moshe came out when he led the Children of Israel out of slavery following the ten plagues and the first Passover; Yosef because "an angel of the L-rd appeared [to him] in a dream in Egypt, saying, 'Rise, take the child and his mother and go to the land of Israel, for those who sought the child's life are dead'" (Matthew 2:19-20, ESV). There is a further intersection between Yeshua's life and a donkey recorded in all four gospels: "And Yeshua found a young donkey and sat on it, just as it is written, 'Fear not, daughter of Zion; behold, your king is coming, sitting on a donkey's colt!'" (John 12:14-15, ESV). Here, Yeshua deliberately selects a donkey and rides it down the Mount of Olives into Jerusalem in order to fulfil the words of Zechariah's prophecy. At the same time, He is also starting a journey and making a migration: He is starting His own final journey to the cross that will bring His time of ministry on earth to a close; He is also starting the journey of the church, the group of people who would be His followers and would share the gospel with all the nations of the world. During the next week, aware that something is changing, "Simon Peter said to Him, 'Lord, where are you going?'" (13:36a, ESV) and received the reply, "Where I am going you cannot follow me now, but you will follow afterward" (v. 36b, ESV). Yeshua alone is leading the way, but His disciples are called to enter upon the same journey. That seemed as clear as mud to the disciples, so only a few minutes later, "Thomas said to Him, 'Lord, we do not know where You are going. How can we know the way?'" (14:5, ESV), receiving the reply, "I am the way, and the truth, and the life. No one comes to the Father except through Me" (v. 6). Yeshua is our directions for travel, the way in which we place our feet, the means of sustenance in the journey and the destination to which we go. Have you ever received one of those automatic e-mail responses - "I will be away from my desk out of the country for the next three weeks with limited Internet access ..."? However annoying it is to have missed the person you wanted to contact, this tells you something about that person: they are prepared to pack up a suitcase and step outside their comfort zone, travelling into a different legal jurisdiction and probably natural first language, possibly taking a step into the unknown. Not everyone goes up the Amazon in a canoe, surveys the giant frogs in Lake Titicaca or follows the White Nile from Khartoum to Lake Victoria, but every journey is away from home and the physical security of bricks and mortar. Avraham heard G-d's call and went: "By faith he went to live in the land of promise, as in a foreign land, living in tents with Yitz'khak and Ya'akov, heirs with him of the same promise" (Hebrews 11:9, ESV). So can you - what are you waiting for? Application: Are you on the journey yet? Have you heard "the upward call of G-d in Messiah Yeshua" (Philippians 3:14, ESV) and recognised that you need to actually saddle your donkey and set out in response? The Divine Travel Agent is just waiting for your call - don't just buy a ticket: get out there on the trail!